Bullriding fans, this press release has just hit my inbox! Don’t miss this opportunity to watch one of the greatest bulls in history buck! San Antonio, Texas, October 3, 2013 — On Saturday, October 12, 2013, Cowboys Dance Hall will host a Professional Bull Riders (PBR) Special Event where a bounty of $5000 will be paid out to the Professional Bull Rider who can ride eight seconds on the #1 Built Ford Tough Series Ranked (BTFS) Bull, Bushwacker. Owned by Julio Moreno Bucking Bulls, Bushwacker is an American Bucking Bull born in 2005, currently weighing in at 1500 pounds. His record is 50-1 against the top bull riders in the world with an average buck-off time of 3.28 seconds. Bushwacker will join other top-ranked bulls, including Nitro Carrilo Cartel as they prepare for the PBR World Finals in Las Vegas, October 23-27, 2013. This is the last PBR event before the World Finals in Las Vegas, so get your tickets now! General Admission Advance Tickets are $10.00 (21 and Over)/$15.00 (18-20) and available for purchase at http://www.cowboysdancehall.com/San-Antonio/Events/ or get your General Admission Tickets at the door Saturday night for $15.00 (21 and Over)/$20.00 (18-20). Cowboys Dance Hall is located at 3030 NE Loop 410@I35, San Antonio Texas 78218. For more information on this event or any future events, contact 210.646.9378 or visit www.cowboysdancehall.com. 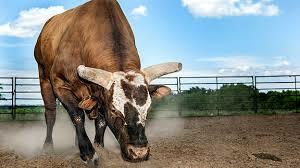 Bushwacker even has his own Facebook Fan Page –> Click HERE!